KIRKE, SIR LEWIS, adventurer and trader, brother of Sir David and Thomas Kirke; b. c. 1599 at Dieppe; d. ante 1683. Lewis accompanied his brothers David, Thomas, John, and James as second-in-command of the expeditions to capture Quebec in 1628 and 1629. 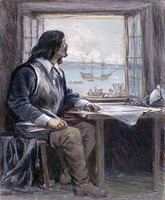 In the latter year he carried David’s letter, demanding surrender of the post, to Champlain. He was distinguished by the French for his gentlemanly behaviour and generous treatment of the Roman Catholic clergy captured at Quebec. He was in Quebec in 1631 and again in 1632 when the post was restored to the French and may have been there throughout the occupation. In 1633 he received a patent from Charles I to trade and colonize in the St. Lawrence valley and Nova Scotia. He was sent out in the Mary Fortune by David Kirke and a number of other adventurers with a £12,000 cargo which was seized by the French and for which no compensation was received. His patent was also challenged by Sir William Alexander the elder, who had a prior patent in the area. In 1634 he commanded a fleet of three vessels dispatched to Canada by David Kirke and his associates but it was forced to put back into Plymouth because of a storm. The next year Lewis was made captain of the naval ship Leopard and was engaged in battles with Dunkirk ships and in a search for Turkish pirates near Guernsey. He was in command of the Repulse in 1636 but the following year was transferred to the Margaret when he refused to serve under Admiral Rainsborough in the fleet off the Netherlands. 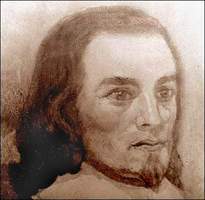 He was next found in Newfoundland collecting the 5 per cent levy of the fish and oil taken by foreign fishermen, which the patent of 1637 had authorized [see Sir David Kirke]. His actions brought him into conflict with the Basque fishermen in Trinity Harbour. In 1640 he was lieutenant-colonel in charge of levies in the eastern division of Northampton County. He was charged jointly with Lord Morley in 1641 with the murder of a Capt. Peter Clarke and was convicted, although it was generally believed that the acquitted Lord Morley was the principal agent in the murder. Lewis Kirke must have subsequently been pardoned for he served in the royalist army during the Civil War and was knighted in 1643. He was governor of the stronghold of Bridgnorth in 1643 and 1644, and was later accused of torturing supposed parliamentary informers in that town. He surrendered to the revolutionary forces and compounded under the Oxford Articles of 1646, but was arrested in 1647 on the suit of a man whose estate he had seized during the war. Sir Lewis pleaded benefit of the Oxford Articles which was denied because he had not paid the fine imposed on compounders. 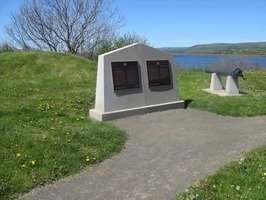 In 1650 he gave two sureties of £1,000 each for his good behaviour towards the revolutionary government before being allowed to visit his brother Sir David in Newfoundland. He appears to have been reconciled with the government for in 1654 with his brothers John and James he petitioned Cromwell’s Council of State for the claim of £48,000 unpaid from the 1632 settlement with the French regarding Quebec. Provision for a final settlement was contained in the French treaty of 1655, but as late as 1667 the terms had not been fulfilled and Sir Lewis was asking Charles II not to return Nova Scotia to the French until they complied. After the Restoration he and John also petitioned the king to force Thomas Temple to return lands and property in Nova Scotia which they claimed belonged to them under the patent of 1633. Sir Lewis was appointed captain and paymaster of the corps of Gentlemen-at-Arms by Charles II, perhaps as compensation for the loss of his claims in North America. His heirs are mentioned in a petition of Sir David Kirke’s widow in 1683. See sources for Sir David Kirke. John S. Moir, “KIRKE, SIR LEWIS,” in Dictionary of Canadian Biography, vol. 1, University of Toronto/Université Laval, 2003–, accessed April 20, 2019, http://www.biographi.ca/en/bio/kirke_lewis_1E.html.